The Woodlawn Mechanical Biological Treatment (MBT) Facility is located in the Goulburn Mulwaree Council shire outside the small town of Tarago, NSW. The site was once the Woodlawn Open Cut Mine which produced zinc, lead and copper ore until 1998. Veolia Environmental Services (VES) re-established the site as a waste disposal facility called Woodlawn Bioreactor for Sydney’s southern suburbs general solid waste and also uses the by-products to generate electricity. Veolia's Mechanical Biological Treatment facility is 700 metres long and will cover a total 1.5 hectares. The plant utilises four 50m drums to separate waste before it goes on to pasteurisation and fermentation processes. The refined compost is then set out in windrows (far left) for use on mine rehabilitation. 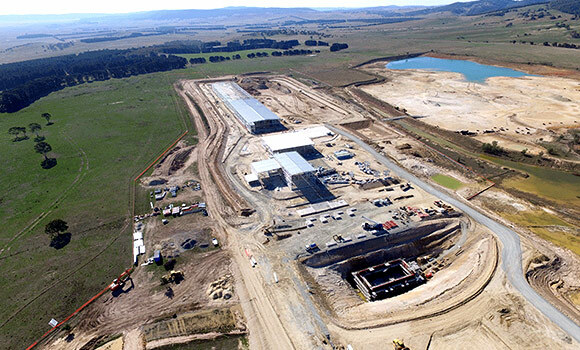 The plant is designed to separate organics from mixed household waste to create compost suitable for the mine rehabilitation and to reduce the amount of waste going to landfill. It will have a design throughput of around 120,000 tonnes per year, producing roughly 72,000 tonnes of compost. Veolia intends to use the organics onsite for mine rehabilitation. The MBT will also form part of larger developments at Woodlawn, which accepts around 20% of Sydney's putrescible waste materials and is licensed to accept up to 1.1 million tonnes per year. It will be the first landfill alternative at Woodlawn and Veolia's first MBT in Australia. Eilbeck Cranes was commissioned by Lipman Pty Ltd who constructs the facility, to design and manufacture a suitable crane for the continuous operation of moving waste from the dump to conveyor. The resulting heavy-duty double girder overhead travelling crane boasts high travelling and lifting speeds. It has been tested and commissioned in December 2016. Single Line Lift:	The rope comes straight off the drum and connects directly to load (no reeving).